Member of the American Society of Nephrology. 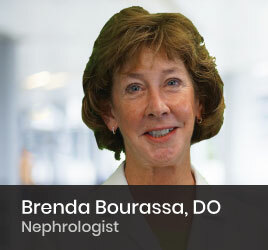 Dr. Bourassa has been practicing nephrology since 1998. She enjoys the field of nephrology because of the challenging medical problems present in the renal patient population. Dr. Bourassa specializes in the kidney, treating such ailments as hypertension (high blood pressure), kidney stones and kidney failure, which can now be managed using dialysis. When not involved in patient care, Dr. Bourassa enjoys traveling and golfing.